Hey everyone – I know I still owe a “top 5 table-service restaurants” post from the rest of the family but they are being extremely difficult to work with. Tons of demands before I can even get in for an interview. Bottled water at room temperature. Bowls of just green M&M’s. Total divas. I promise I will get it posted as soon as I can. In the meantime, we DID do another Disney night super terrific happy hour time. And this one was a DOUBLE FEATURE! I wrote that in caps so you would get super excited. It’s an old marketer’s trick. Like subli-wayneisawesome-minal messaging. So this night was just the four of us (well, Daisy and the rats were present as well). And I know what you’re thinking – but no, even Stephanie wasn’t there. I’m shocked too. Question: Is the Swedish Chef really tiny? Or are all the other Muppets just ginormous? 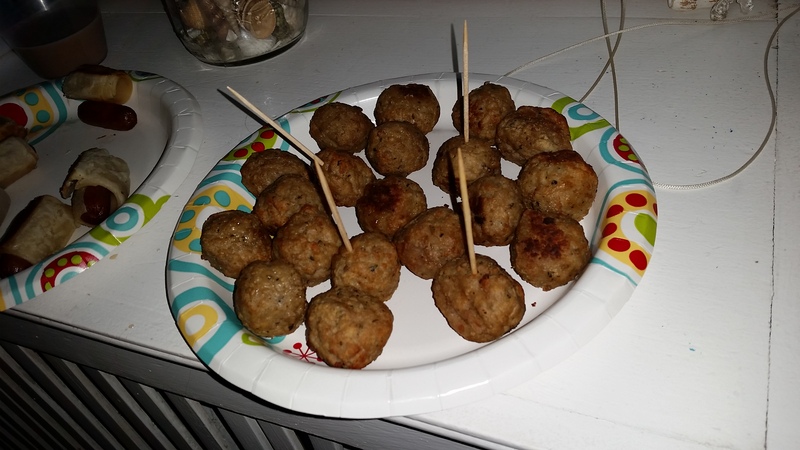 For food, we had a sort of smorgasbord (bork bork bork!). 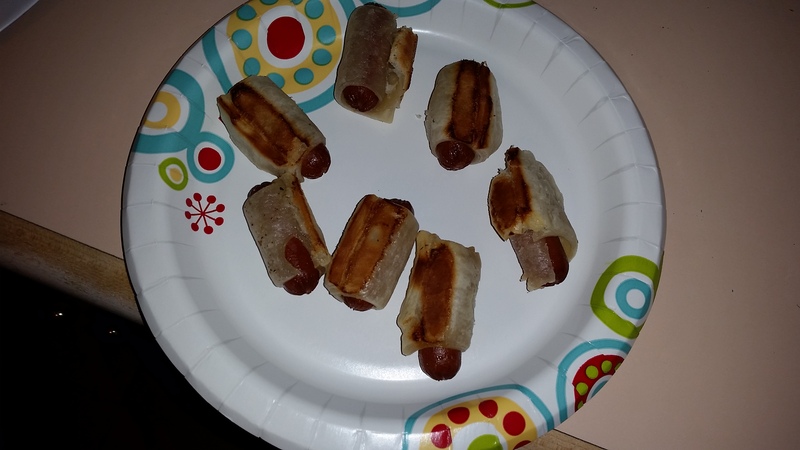 We weren’t starving as I think we had just had lunch so we had Swedish meatballs (ahem, bork) and we disturbingly ate pigs in blankets. You will see that on occasion we actually eat the characters in the movies such as when we have fish sticks when we watch Nemo. It’s morbidly delicious! 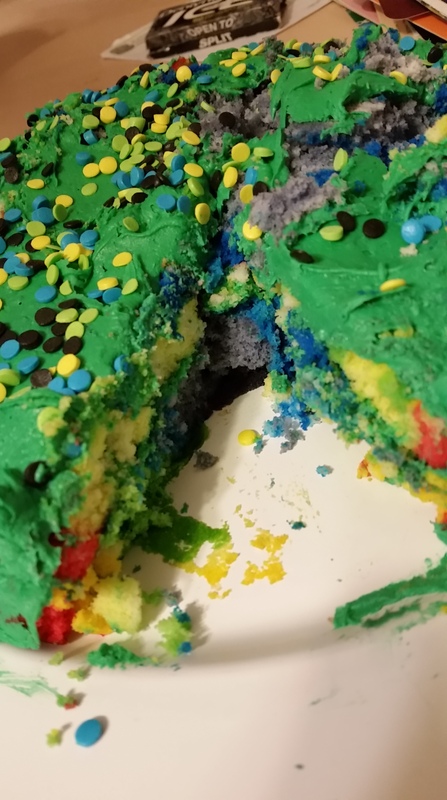 I also attempted to make a rainbow “connection” cake. But I guess I didn’t spray the cake pans enough because it ended up being more of a rainbow pile. The green frosting helped to glue some of it back together and I did my best to photograph it at such an angle as to give the impression of a well-structured dessert but alas, it was a sugary disaster. Nickie and the kids still tried to tell me it came out fine, but I could see the disappointment in their eyes. See? From here, it kind of looks cake-ish. That’s right – we set up a stage and show off our collective, um, talents. The four of us each put together a different act and performed in between movies. Sort of an intermission of sorts. Sorta. We had video but I can’t seem to get it off my phone. So all you have are pictures to go on. And your imagination. And that’s really the best of all the nations. First up was Myles. As what one can only see as a nod to the Great Gonzo, he played the trumpet to kick off the show. 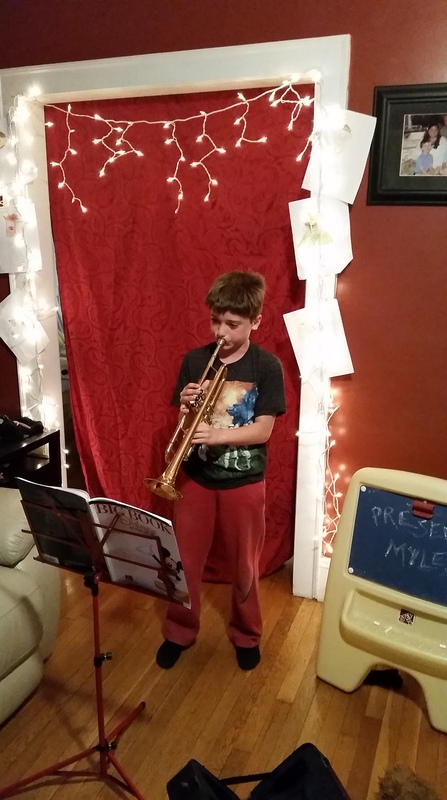 Myles – Totally kicked brass. 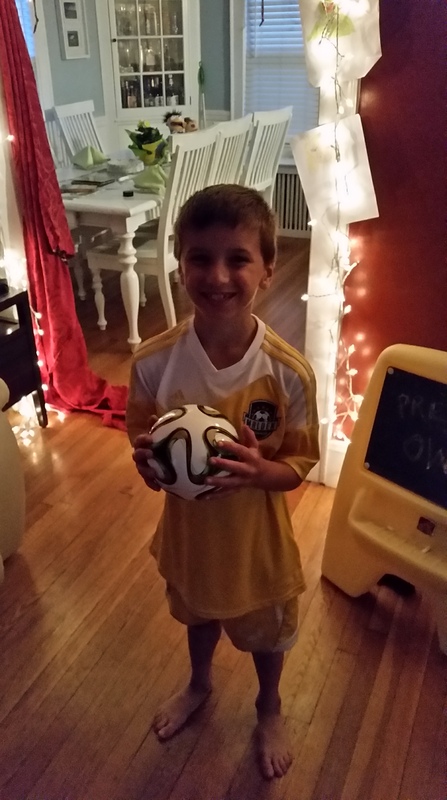 Then came Owen, who showed off his ability to hit a soccer ball with his head. We are very proud. Nickie performed a Vaudeville-type act with Owen as the straight man. 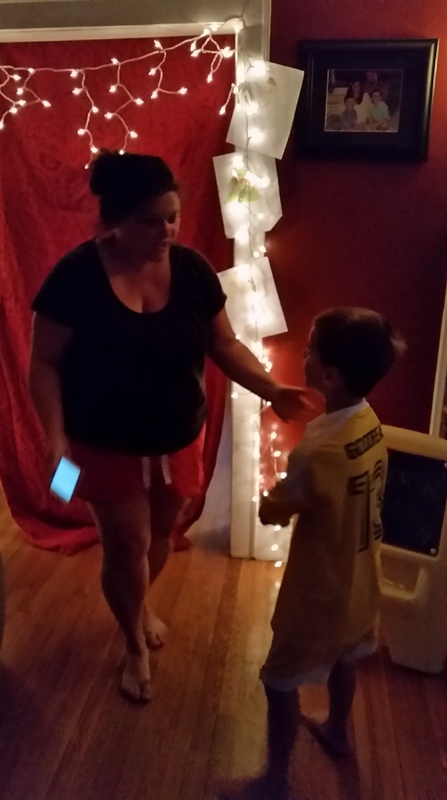 The knock-knock jokes were in full effect, yo. And I performed together with DAISY THE WONDER DOG. There is actually no pic of this so please imagine she rolled over, played dead and rode a scooter rather than just ran around like an insane person and ate all of the treats out of my hand at once. Oh, Muppets, where do I begin? I mean, I just love them so much. As I said earlier, it is really hard for me to trust anyone that doesn’t like the Muppets because for me, they have always just meant pure joy. I remember watching the Muppet Show when I was a kid. I remember playing my vinyl copy of The Muppet Movie soundtrack over and over again on our living room record player. Muppet Babies was, for a long time, my absolute favorite of all the Saturday morning cartoons out there. I still remember losing it when I found out that Jim Henson had died (and subsequently losing it when the Muppets found out) And introducing my children to the world of the Muppets has been one of my truest pleasures. 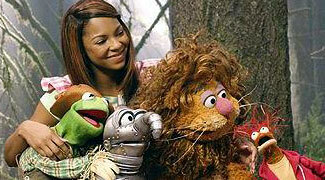 And I mean, I love Sesame Street and enjoy Fraggle Rock, but the Muppets are where it’s at. 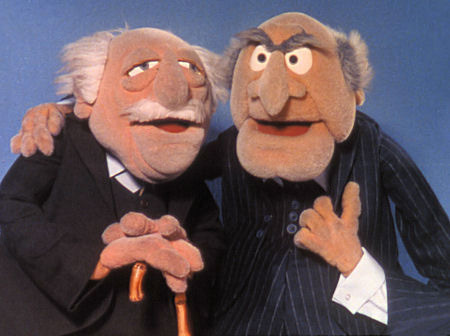 Watching the Muppets has always simply been fun in its purest sense. When the Muppets are at their best, they are pretty much a joke a minute, throwing pratfalls and puns at you faster than…um…something that is really fast. The Muppet Show is pretty much 30 Rock with puppets. I laugh FOR REAL at the Muppets. But being funny isn’t why I LOVE the Muppets. I connect with them on such a deep level. I love how much despite their differences you can tell they love each other and they work within such a realistic family dynamic. 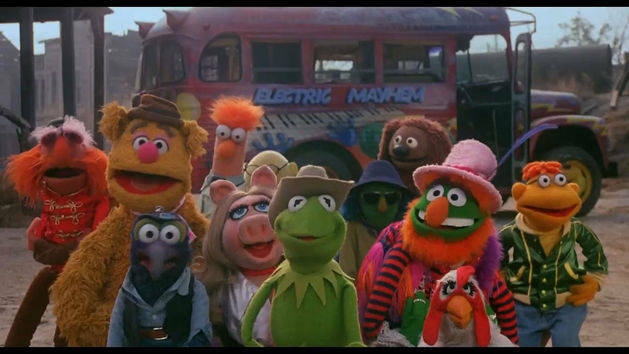 The scene in The Muppet Movie when Kermit stands up to Doc Hopper in the ghost town, as all the other Muppets stand behind Kermit and he talks about them sharing the same dream exemplifies everything I love about the Muppets. I mean, they literally have Kermit’s back in that scene. And it’s amazing how Jim Henson and his team brought so much warmth and “real” to their creations. It’s why I bristle when people call them puppets. They AREN’T puppets. They are Muppets. And then, just a few seconds later, GIANT ANIMAL. It’s been that balance of “out there” with “in here” that has fueled my strong love for the Muppets all these years. When we first saw The Muppets in the theaters a few years back, I loved it. I mean…LOVED it. It made me laugh, it made me cry and it made me smile, like non-stop. But it also raised some questions for me. I mean, the Muppets hadn’t really gone away ever, right? They have continued to make movies, television specials and programs for decades. Yet this was the core plot point of the movie – the irrelevance of the Muppets and their decrease in popularity. So I asked myself, “How can this be, Wayne?” Good question, me. But I think I figured out at least part of it. I think it’s no secret that, since the death of Jim Henson in 1990, the Muppets have struggled a little to find their way. Since then, their biggest “successes” have weirdly focused on them more as “actors” playing parts in stories we already know – say in Muppet Christmas Carol or Muppet Treasure Island (or when it hasn’t worked as in the god-awful Muppet Wizard of Oz.) And when they have tried to focus squarely on the Muppets, as in Muppets From Space, let’s just say it hasn’t worked all too well. The Muppets, though, served as a reset button for me. It put the Muppets back in as the focus and showed them as beings with their own personalities, rather than vehicles for known commodities. I connected with this film because it brought so much back of what I didn’t realize had been missing. And it plays very well as the second-part of a double-feature with The Muppet Movie because both have very similar vibes to them. Whereas The Muppet Movie is about how the Muppets first come together and become a family, The Muppets very much feels like a reunion. And it felt great to be back together. Again. One more sort of overall point here. Despite how the Muppets struggled in the 90’s, I can’t think of a better partnership than Disney and the Jim Henson Company. At least from a personal standpoint. 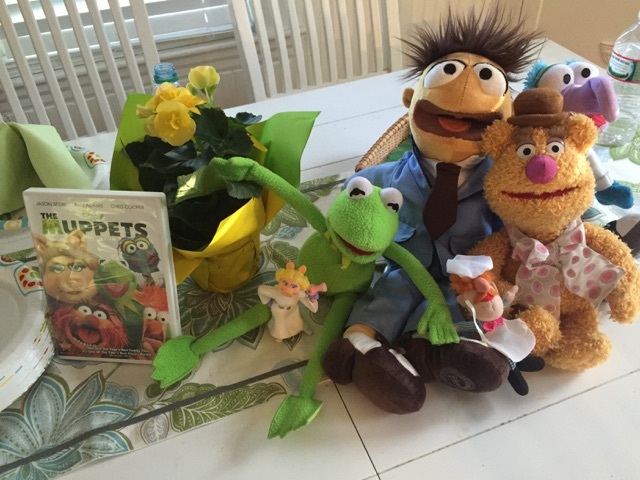 Gonzo says in The Muppet Movie, “there’s not a word yet for old friends who’ve just met.” And honestly, I wish there was…or better yet a word for old friends who never met. Jim Henson and Walt Disney were such an integral part of my childhood (and let’s face it, pretty much my adulthood as well). Their characters and stories have endured the ups and downs of life and enabled me to hold onto at least some of the magic that so often disappears after childhood fades. So thank you to both of you from me and from all the other lovers and dreamers out there.